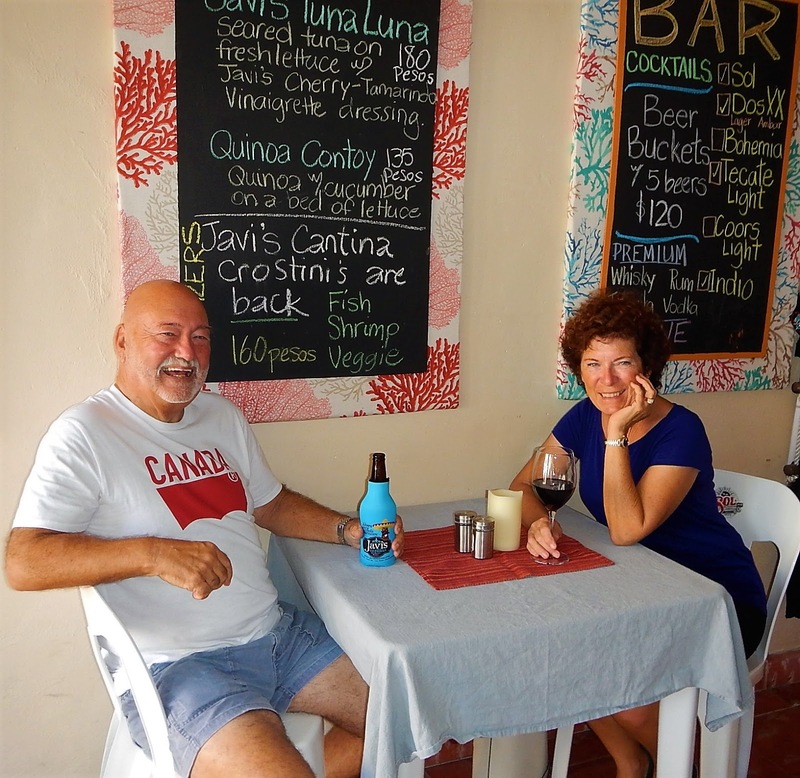 Anyone who has spent any time around Lawrie and I, has heard the stories about our years as volunteer ambulance attendants and firefighters in a small Canadian community similar to Isla Mujeres. Over time we developed a very black sense of humour about death. It was our protection, our coping mechanism. When you frequently take friends on their last ride, you need a way to deal with the grief. “It happens to everyone,” I would say with a shrug. It’s what you do when you are a firefighter, an ambulance attendant, a nurse, a doctor, a caregiver, a hospice worker, a police officer, a mortician, an undertaker, a medical examiner, or anyone working with the dead or dying. You cope or you turn to drugs, alcohol, and physical abuse of family members. Belatedly, after Lawrie’s recent death, I learned how deep the pain can be when you lose your lover, your spouse, your adventure partner and your best friend. I was very familiar with grief. My dad died when I was seventeen, but our family didn’t talk about it. It was always the undiscussed elephant in the room. My mom died when I was thirty-six. She had been completely miserable since my dad’s death, so in a small way it was a blessing that she didn’t have to suffer any longer. And now I understand her grief, her anger, her pain. Every single day I miss Lawrie’s killer-gorgeous smile, his touch, his voice. I miss his laughter and good humour. He never saw the negative, only the positive. I miss the smell of him. I kept his bottle of d’Issey just so that I can remember. I miss him cruising around the Soggy Peso bar on Isla Mujeres, at least once a week, regaling the newcomers with his stories of living in paradise. I admit, I had heard the stories a few hundred times and eventually tuned him out. Now, I desperately wish I had a video of the Social Butterflydoing his meet and greet and making newbies feel welcome. I miss his never-ending need for adventure, and another damn British car. I can’t tell you how many times I cursed the 1991 DBS V8 Aston Martin, nicknamed Ashley, for just stopping with no warning. The engine was so huge the gas would boil out and she would stop. Eventually after she had cooled down, she would consent to continue our journey. I miss him asking me, “Where are you and Sparky going this morning?” He always wanted to know in case I had a mechanical problem with the golf cart. Sometimes I would respond, “For heaven’s sake, sweetie, it’s a five mile long island. I can’t get lost.” But he had to know, every single day where I was headed. I really miss someone caring that much about me. I miss bringing his morning coffee to him in bed for most of those thirty-eight years, and recently being reminded, daily, that he like more caramel syrup drizzled on his coffee than I did. I miss him noticing that the container of sugar was getting low, and invariably he would ask me, “Do we have more sugar?” He wouldn’t drink his coffee without three teaspoons of sugar. I miss his company at mealtime, and I even miss his quirky dislike of most vegetables especially broccoli, asparagus and Brussel sprouts. I miss that he refused to eat foods that started with ‘y’ – because his dad didn’t like them. Think about that one: yoghurt, and yams. That’s all there was in our Canadian food world at that time that started with ‘y’. I miss listening to his frequent chatty telephone conversations to his son, his grandsons, his sister, his brother, old friends and new friends. He also had weekly conversations with a feisty woman, Edie Parker, whom he has always referred to as his ex-almost-mother-in-law. She is the second wife of his ex-father-in-law. She is healthy, alert, lives in her own home and still drives. She will be ninety-seven on her next birthday. Edie is a little pissed off that Lawrie is gone, and she’s still here. I miss him teasing his then-teenage-son, John, and later his two grandsons about anything that would make teenage boys squirm and blush. I miss his company for evening cocktails. I loved it when he could still pour me my evening glass of wine. I miss being able to reach across the bed and hug him. I even miss his snoring! I miss his daily proposal to me, “Will you marry me?” He asked me every single day for thirty-eight years. But most of all I miss dancing with him. That’s how we fell in love, dancing. To our many friends who have lost their loved ones, I apologize. I had no idea how difficult it would be.